Something tells me I’m not a joiny-in sort of person. Wherever you look on people’s blogs, they all seem to be joining in something. Primarily photo challenge things, or sometimes books, or sometimes just ‘write a post about whatever word/s we suggest’. One of the reasons is apparently to get people to blog more often, by giving them inspiration. Now, that is not a problem for me. I don’t need topics for posts. I could spend all day blogging on my countless blogs – but I do have other things to do. I suppose the second reason must be to encourage networking. But, people, these ‘games (? )’ have rules!! Some more Draconian than others. You are invariably meant to tag your post, link it back, email it, upload it to someone else’s site, and goodness knows what else. I lose the will to live reading through the rules. I thought blogging was meant to be fun. So I admire people who can manage this sort of thing. I can’t. One of my friends is taking part in a photo a day!! Taking a photo every day (although not necessarily posting every day). What happens when you go on holiday or you aren’t on the internet to find out the subject of the day? Anyway, she has stuck with it so far and produced some interesting interpretations of the subject, and fortunately some text to go with it. I really dislike the type of photo blog where people show off their incredible skill and expertise courtesy of photoshop and/or £1000+ DSLR, there is no accompanying text ‘cos natch a pic is worth 1000 words, and they have 20 comments, all of which say ‘Supah photo dahling.’ Talk about wasting time. Another friend set up a colour weekly theme – which at least was a bit less onerous. ‘Simple,’ I thought. ‘What on earth does one photo for that?’ Not that it is difficult, there is too much choice. The colour-related one was red and tomato soup. The pic every day of the year one was breakfast. ‘Wait’, I thought to myself excitedly. ‘I could join in this and kill three of these games/challenges with one pic.’ I was making red pepper and tomato soup, and it was a very simple recipe, and the leftovers would be my breakfast. Excellent. I pondered whether to add a swirl of yoghurt and coriander to my breakfast helping or whether to leave it simply red. Of course, you can imagine what happened. And no we didn’t eat it all for supper. But I got it down my neck so fast this morning that I totally forgot about all these games and never took the pic. That’s the nearest I will probably ever get to participating. An all-round fail! Put onion in pan with olive oil, or whatever you prefer, and let them soften. Add garlic if you like garlic. Add red pimientos and cook until they soften too. Add anything else you fancy. When you think it is ready enough, zap it up in a batadora. Simple huh? Also quite delicious. It also suggests adding orange – some to the soup, and a slice floating on top. Getting away from the simple here methinks. Almost forgot, my recipe book that I didn’t follow, suggested using a tin of toms. And tabasco, but that is always on the table anyway so irrelevant. 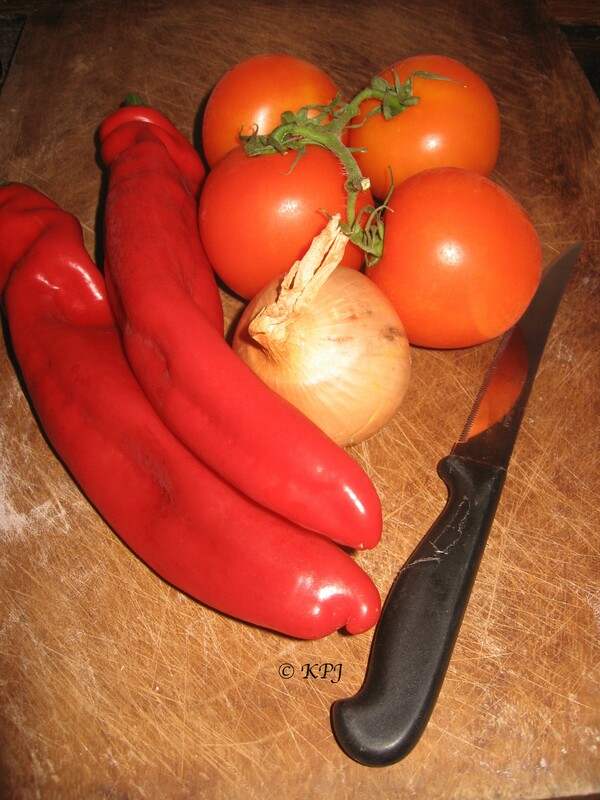 But seriously, tomatoes, red peppers and onion are a great soup base. Wish I’d made more. Back to all the photo stuff after that tasty interlude. If you are interested in the links for these sort of things, drop me a comment below and I’ll add the ones I know of, but right now that’s not my priority as I want to add some other links. What I do enjoy reading are people’s personal blogs where they have decent photos. They don’t have to be brilliant, but it does help when they are part of a story rather than just something plonked on a page for the artist to sit back and wait for the praise to pour in. Any regular reader will know I have a dogblog. And it’s always good to find new dogblogs whose person has their own blog. JB is a cat, and her mum has a super travel blog where she features animal shots and travel ones combined. Check it out here. Co-incidentally another cat – Mandu, also has a person with a travel blog. Check out her blog here. Chancy (a dog), has a person with her own blog, not a travel blog, but a personal one like most of us have. However most of us don’t manage to take such excellent photos of birds in our back garden. Have look at hers here. Almost forgot – I did stumble across a stunning photo blog that didn’t have too many supah dahling comments on it. Here it is for those of you out there who do enjoy photoblogs. Well worth a look. I’m also in the midst of organising all my blogs, links, categories etc so asking for patience if anything doesn’t function in the short-term. Clouds blog is now here. And as a last comment, a good friend has started an interesting business in longboard skateboards – or skateboard longboards? Whatever. I mention this because she has not spammed anyone about it, she has courteously and politely asked on her own blog if anyone would mind linking to it. I think that is the perfect way to behave – although probably not the best in hard sell terms. So I have no problem in providing a link to their blog here, and wish them all the best in their venture. Everyone knows, it’s hard enough starting off in business as it is. Good luck with Blacklongboards. Yes, you are right re all the ‘meme’s – too many just photo shoots, too many just plain silly, just too many full stop. I’m using a few now as a prompt to post for my sanity as unlike you I’m no journalist with a wealth of interesting stuff to impart. And if I post a photo I like to think it fits my topic however pathetic, as I’m not into blogging for ‘Comments’ anymore. The soup recipe I’m coping as sounds delicious as I know I should be making my own rather than buying supermarket Morrisions! Truth is, I think if we are blogging we shouldn’t need to be struggling for posts. I know it’s slightly controversial as people do like to join in these things, and that’s fine by me. But I don’t. Often inspiration for blog posts comes from others, like my one on Clouds where a comment from you made me think. That’s all that’s needed. But it’s not ring a ring of roses. You may wish to add cheese to the recipe. The one that I loosely used had gorgonzola or really anything. I don’t think it needs it, but it may suit you. TY for the tip re a cheese addition to the soup – will try it out this w/e, which is forecast to be chilly here, so perfect comfort soup weather, even though I do enjoy all year! For me prompts re posts help, I take mine from anywhere if they interest me. Games are ok for a while, but for me, happier being elsewhere reading, writing, and connecting with people differently. Enjoying reading your more frequent posts. It’s the photo blogger without all the supah dahling comments. Too funny! I agree that simply gushing compliments without saying anything personal or substantial – or both – can easily wear thin. It is the connections with others that make it enjoyable for me. In fact my favourite post is one that became possible simply because a stranger took the time to suggest a photo op for a sunset. If he hadn’t taken the time to point it out, or the patience to encourage me while I was hesitating, I would have missed what has become one of my best clicks to date. It also happened to get the most comments, but that was not what made it the favourite one. In any event I am quite thrilled you included my newbie blog as a recommendation. Much appreciated! By the way, your soup sounds yummy, and your ingredients look brilliant. Well-captured, compliments not withstanding :) thanks for sharing. Don’t know if it was the pic you meant but I did like the bench one. Didn’t seem to follow any rules actually, just struck me as a class shot. Pic for the post, no more no less, otherwise I would have got all of the left hand pepper in the shot :D Therein lies the difference. You certainly are welcome anytime. just realized that I did not get back to you with regard to the post I was referring to. My bad. In any event, you can get there by clicking on my name attached to this response. Well, must run. Have a great weekend. Pippa indicated there is a yummy recipe story coming to rough seas soon so will watch for it. Just had a look at your photo (nearly used the s word there) and it’s brilliant. I can see why you got so many comments. I don’t think you need an 84th :D It would have taken me a while to find it so thanks for the link. I must make some time to have a longer browse through though, especially as you add context to your photos, which is what makes your photoblog so different – and much better – than all the other boring ones. I use the photo challenges and things as prompts, but I don’t link back anywhere. No pressure, just fun. LOL at the link comment :D I’ve been blogging for five years so I should know how to link by now. I actually learned it on forums first where you do the url BB software link, but I picked up html link coding when I decided to learn basic HTML. Of course, you don’t really need it on here as you can just click the button, but sometimes it is as easy to write the code in, especially when you draft posts elsewhere first.